For a Wild Woman’s contemplation…a Prayer Bead necklace. This necklace is a beautiful evocation of raw desert energy. Been working on this beauty for a while…it has beautiful beadwork and a found stone Pueblo star! I am having a storewide sale both in this shop and my Etsy shop, Desert Talismans, to celebrate the arrival of Autumn and cooler weather! Starting here TODAY at 11:45 am (why that time is anyone’s guess, but that’s what Squarespace decided…) EVERYTHING WILL BE 30% OFF THROUGH THE END OF SEPTEMBER. Now is the time to go for those talismans that have been calling you for so long. This fall I am participating in the Placitas Holiday Sale and expect to be selling a number of pieces there, so if you are counting on something, I recommend that you do not wait. And if you are in the area, be sure to come on up to Anasazi Fields Winery and see me! This is a terrific juried show which draws many people from far and wide. I am also being called to devote more of my time to painting and drawing and will be listing new pieces in the shops as they come available. Creating prints and print sales are also a possibility being researched. Finally, I am developing workshops on various spiritual subjects, another long-neglected area that is demanding attention. So there are many exciting new things in the works! Stay tuned for more details and enjoy the sale! The second is this Cobra jasper statement ring in luscious creams and whites...enjoy!! A perfect ring for everyday! Don't wait on this one, I only have one of these Morrisonite jasper cabs for rings. 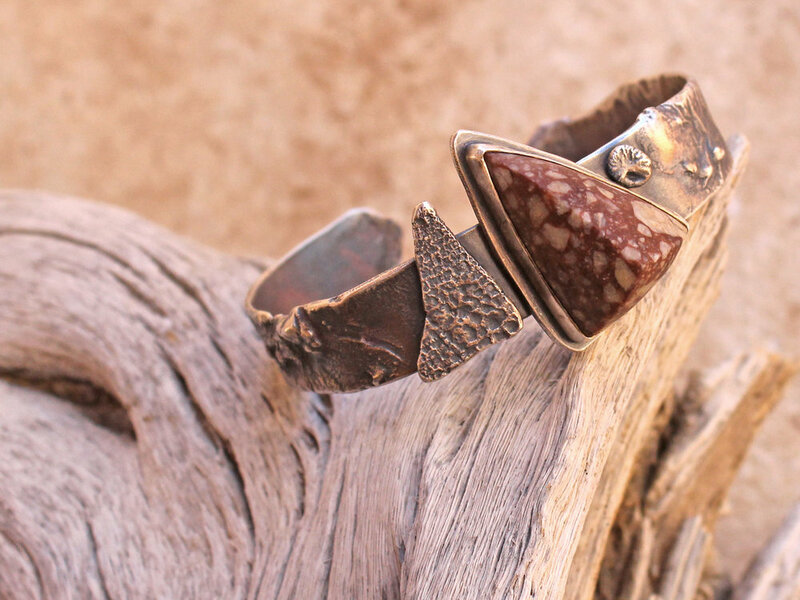 And just listed in my Etsy shop, this great cuff bracelet with a Pima Canyon stone from the Sonoran desert! $290. Finally I am getting new pieces listed, after a very busy week followed by my kitty, Zia, who needed emergency surgery this weekend. All is looking to turn out well, and meanwhile I have four new pieces after this one, waiting to be listed. Look for them in the next couple of days. Hello everyone! I have been hard at work on a large mixed media drawing this week, but have managed to do this necklace as well. The amber is just incredible and these unworked pieces are hard to come by. I will be back at work on new talismans in the coming week.